Preheat oven to 350. Cut off the top of the pumpkin and throughly clean out the seeds and pulp (just as if you were getting ready to carve). Saute onions in oil until tender. Add ground beef and cook until brown, drain. To beef add; soy sauce, brown sugar, mushrooms, and soup. Simmer 10 minutes stirring occasionally. Add rice and water chestnuts. 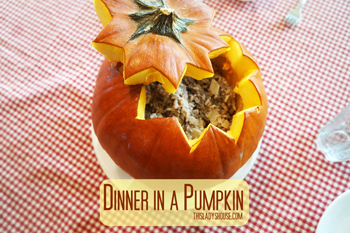 Spoon beef mixture into the clean pumpkin. Place the top back on the pumpkin, put the entire pumpkin on a baking sheet and bake for 1 hour or until pumpkin is tender. When serving, gently scrape the sides of the pumpkin to serve as your vegetable. My kids LOVE to eat out of their pumpkins! This entry was posted in Recipe and tagged Beef, Dinner.